Either I have a thing for clingy foster dogs or I am really bad at taking dog pictures. Probably both. This is Pepper. Pepper is an 8 month old, 8 pound dachsund/chihuahua mix. She was adopted from the Humane Society a few months ago, but then was brought back with a broken leg. I don't know the circumstances of how the leg was broken or why the family returned her. All I know is that she is sweet, sweet, sweet! When I got her, she had this HUGE cast on her leg. She could barely walk with it. Her leg weighed as much as she does. Poor thing. When I'd pick her up, she wouldn't know where to put her leg. It would stick out funny and she'd use all her energy to fling it to a more comfortable spot. And every single time she'd do the leg-fling, she'd pop me in the chin with the cast. I regret that I didn't get a video of it because it was quite humorous. 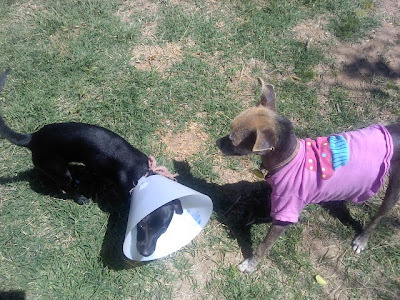 She had to wear the cone to keep her from trying to bite the cast off. I don't blame her for trying though...that thing was huge and heavy and had to be so uncomfortable. Poor dog had a HUGE leg and a head cone. How embarrassing. You know it's pretty sad when Galapogos thinks you're funny-looking! I think the cone and the cast depressed her. For the first week, she wouldn't eat anything. I tried a bunch of different dog foods, dry and canned, and she wouldn't touch them. Eventually she did eat some cat food, so I was mixing cat food with dry dog food to get her some nourishment. 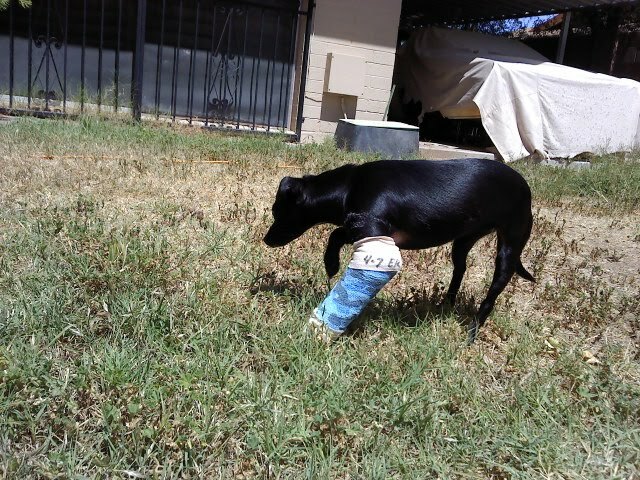 A week after I got her, she was due back at the hospital so they could change her splint, and then yet another splint change was to be scheduled for 2 weeks after that. However, when the vet did the x-ray, she saw that Pepper's leg was already healed (despite the lack of nutrition!) Pepper is magic! So now instead of an 8 week foster, I only get her for 3 weeks. While I'm happy that she is healed and doesn't have to wear a splint or a cone any longer, I would have liked to keep this sweet doggie around a little longer! She is the waggiest little thing! Every time you talk to her, her tail starts going a mile a minute. So cute! I especially like having her around because she is not insane about the baby kitties like my dogs are. My dogs have so completely written me off at this point it's like Pepper is my only dog. Unlike my traitor dogs, she's actually happy to see me when I get home. My dogs are so intent on stalking kitties that I don't think they even know that we have a foster dog in the house. Pepper tries to play with them and they don't even see her. She'll jump up to her full height right into Mo's face saying "Play with me! Play with me! HI! I'M RIGHT HERE!" and Mo doesn't even notice her. Frankie hasn't even sniffed her once. It's all about baby kittens with them. Poor Pepper. How much was all the vet and hospital bills? The Humane Society's clinic does all the medical work. I foster for them so there is no cost to me.